In researching for another report TruePublica unearthed a database dating back to the mid 1990’s and although quite widely publicised some years ago, provides astonishing insight into how dangerous American foreign policy has developed over the decades. The article quotes from a classified report and summizes that a plan, formulated by Henry Kissinger was adopted by the US administration in the 1970’s under President Gerald Ford to use population control methods in regions around the world where threats to their own economic or political power was likely emerging. The article, now over twenty years old, explains in detail the plan to starve millions and keep many countries in a cycle of perpetual emerging nation status through famine or war or both. At the base of the article we have included more links as supporting evidence to Joseph Breda’s 1995 article and attached former World Bank staff Peter Koenig’s latest piece on Washington’s “Financial Genocide” of India. It is time.It is time now. For life’s sake! Hunger on planet Earth is going to end. 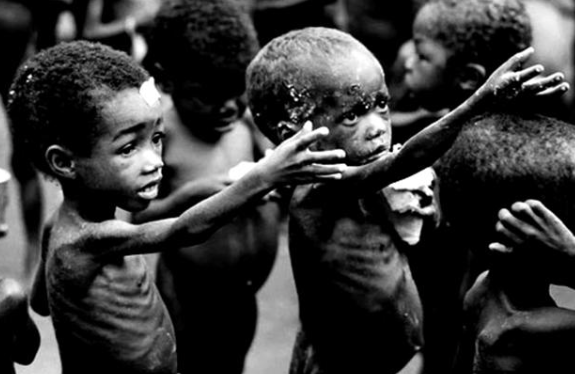 I cry for these children reaching out for food. It’s an horrendous crime against humanity and an abuse of the right and freedom to live in wellbeing. I’m not often that furiously angry for a good cause, but I am now. It is time. Hunger will end on planet Earth and I will bring it to an end. With kindred spirits like me!